80s vs. 90s: And the winner is……. Macky Michael loves the 1980s. He first drove a car in the ‘80s, enjoys listening to the music of the ‘80s, had his first date during that decade and swung his first few rounds of golf in those 1980s. Fittingly, at the Cebu Country Club last weekend, he’s part of the group called the “80s.” These are a bunch of men who were teenagers during those youthful days of the ‘80s. Apart from Macky, they include Iker Aboitiz, Frederic Chiongbian, Jay-Jay Neri, Gassy Lizares, Tining Martinez, Justin Neri, Toby Florendo, Mars Ugarte, Eric Deen, Pico Sarmiento, Nino Bascon, Carl Almario, Jonji Chiongbian, Jess Garcia, Gilbert and Gabriel Yap, Enrico Solon, Tony San Juan and team captain Jovi Unchuan. They’re the 80s team. The ‘90s? They comprise, of course, a group of even younger golfers whose teenaged lives evolved in the 1990s. There’s Jovi Neri, there’s Arlo and Marko Sarmiento, there’s Paolo and Andre Borromeo, there’s Jacob Pimentel, Collin Go, Marc Gonzalez, Mark Dy, Eric Gozo, Kiyofumi Takahashi, Fritz Cabanesas, Ritchie Go, Kim Hong and Raymund Garcia. They’re the 90s team. Last Saturday and Sunday, these two groups met. It wasn’t the first time these clusters of friends gathered; it all started in 1997 when Reny Sarmiento proposed to have a tournament between the two age-groupers. Ten golfers showed up from each side and off they teed-off, with the losing group to pay for the New Year’s Eve buffet meals of the winning squad. That was 11 years ago. Then, in 2003, the concept evolved. The Garcia family wanted to honor the memory of their father and offered a glistening prize called the “Cheling Garcia Cup.” The Garcias paid for the dinner of the participants during the pairings gathering (night before) and the event was launched…. Eighties vs. Nineties. When they first met this same December five years ago, in 2003, the two squads were held to a draw. Nobody owned the Cheling Garcia Cup. 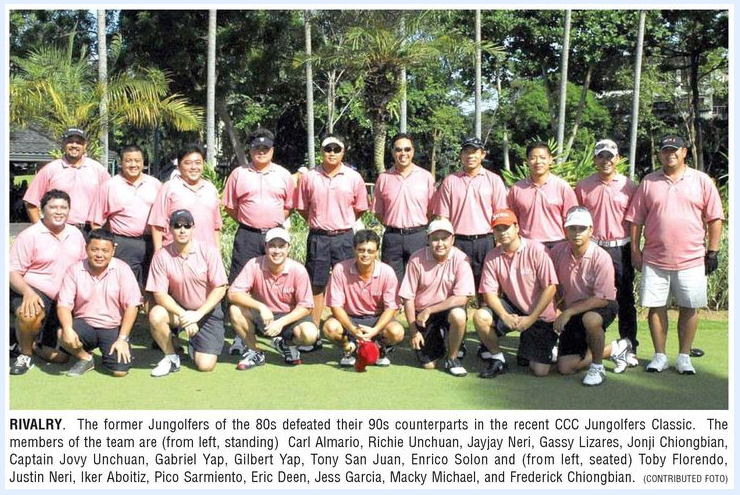 But, the year after, and the year after that, and one more year after that—from 2004 to 2006—the skinnier, less-bulging-tummied 90s team stood atop of the Cebu Country Club greens. They smiled their more youthful smiles, joked that their opponents were “getting too old” and “losing their hair.” Last year, it was a different script: Seeking revenge for three humiliating Decembers, the 80s team finally won, with Toby Florendo as one of the heroes, winning a closely-fought battle on the match-play competition. “In the several years that we’ve organized this tournament,” said Atty. Jovi Neri when we spoke yesterday, “it has always been a closely-fought event. No team has ever won by more than one or two points.” True enough, the same scenario transpired last weekend. On Saturday, 16 points were offered and, after a full day of bogeys and birdies, the 80s and 90s teams were tied, eight points apiece. On Sunday, I decided to watch the battle myself, borrowing a golf cart and watching for an hour….. Iker Aboitiz looked trim and fit. He played Paolo Borromeo who was rushing—not his shots, but to catch a 3 p.m. flight to Manila. Cool and nonchalant, Macky Michael, like he is on the tennis court, is Class-A. On holes 8 and 9, he drove off the tee, hit the white orb at the center of the fairway, then smothered his second shot to land on the green. Easy. Composed. He played Raymund Garcia, team captain of the 90s. Frederic Chiongbian, wearing the light red shirt of the 80s squad, looked indefatigable. He shouldn’t have been. Just seven hours earlier and together with 300 others, we ran together, the entire 4-km. route of The Midnight Run (at the Cebu Business Park grounds). Never mind playing golf on Saturday, sprinting that midnight—he went on to beat Kim Hong in their match play one-on-one. In the end, it came down to the last couple of flights: Eric Deen beat Marko Sarmiento, Jess Garcia tied Arlo Sarmiento, Carl Almario beat Jovi Neri and, when Toby Florendo tied Ritchie Go after trailing 2-down in the 13th, the winners, 16.5 points to 15.5, were declared. As clue, if you listen to Depeche Mode, The Cars, Tears For Fears, Sting and Duran Duran more than to Milli Vanilli, you’re older—and the winners.